Get on your dancing shoes and get ready for an evening of delightful music! The Library is pleased to present the Michael-Louis Smith Septet, performing selections of music popular in New York City during the time period of Jennifer Egan’s novel, Manhattan Beach (1934 to 1944). The selected repertoire, some of which was directly referenced in the novel, will consist of late-period swing and early bebop compositions by musicians and composers such as Duke Ellington, Count Basie, Lester Young, Sydney Bechet, Benny Goodman, Coleman Hawkins, Dizzy Gillespie, and Charlie Parker. 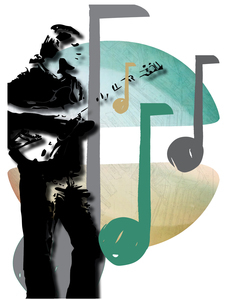 Michael-Louis Smith is a guitarist, composer and educator. He received his Masters in Jazz Studies from the Conservatory of Music at Purchase College and has over two decades of experience arranging, performing, and recording music. Michael, along with his wife Christina and four-year-old son Braven, moved to New Canaan from Harlem, NYC in 2014. Since joining the community he has presented music theory workshops at the Library, he and his band have donated their talents to help the Young Women’s League of New Canaan and helped develop a jazz concert series at the Carriage Barn Arts Center. His latest album, Michael-Louis Smith & Brooklyn Circle “Live In Vermont”, features long time musical collaborators Stacy Dillard (soprano saxophone), Diallo House (upright bass) and Ismail Lawal (drums).